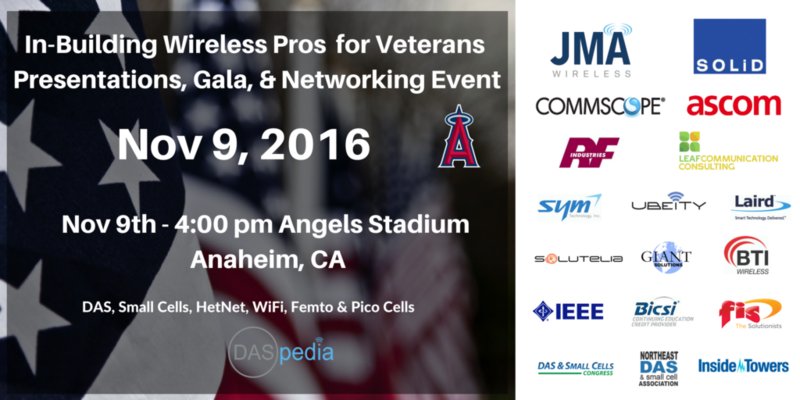 Anaheim, CA – DASpedia, a leading in-building wireless technology education and training firm, is organizing a Wireless for Veterans event on Nov 9, 2016 at Angels Baseball Stadium in Anaheim, CA. The event is sponsored by all major DAS (Distributed Antenna System) OEMs including Commscope, SOLiD, and JMA Wireless. DASpedia is expected to host over 200 attendees for an evening of presentations led by Stephanie A. Stone – The Chief Deputy Director of the County of Los Angeles Department of Military and Veterans Affairs, Steven Lamb – Director of Network Engineering at Verizon Wireless, Ken Sandfeld – President of SOLiD, Tony Schaffer – Area VP, Business Development for JMA Wireless, Brian Domingo – Manager of Business Development at Commscope, and Dan Leaf – US Air Force Veteran and President of Leaf Communications Consulting. The event also includes a performance by New Direction Veterans Choir (made famous by the primetime television show “America’s Got Talent”,) an Angels Stadium tour, a formal dinner reception honoring our military veterans, and a networking mixer. A portion of the proceeds will be donated to a veterans’ charity vetted by the County of Los Angeles Department of Military and Veterans Affairs. For more information about the event or to request an invitation please visit www.daspedia.com/events. DASpedia is conceived and created to facilitate connections and interchange within the various segments of the DAS & Small Cell community and In-Building Wireless industry: from designers, engineers, technicians and their support teams to suppliers and manufacturers and everyone in between. It is a place to share your ideas, meet talented individuals, research new products/technology, discover new opportunities and keep up-to-date with the current happenings in the wireless world. A Southern California company since the summer of 2014, DASpedia consists of experienced, knowledgeable staff. For more information visit http://www.daspedia.com or follow DASpedia on Twitter at @DASpedia.